George Bills Gallery is pleased to present the gallery’s fourth solo exhibition of paintings by Christopher Stott. The exhibition will feature the artist’s recent work and runs from May 21 - June 25, 2016, with an opening reception the night of the 21st. The artist writes of his work, “I approach my work with a naturalistic styling and a strong sense of minimalism and order. 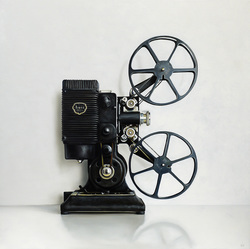 “I paint a wide variety of vintage and antique objects including typewriters, books, clocks, projectors and cameras among other common technology and gadgets. As subjects, they have built-in narrative – they tell stories. Translating them to painting creates an intimate, slower viewing experience. My hope is that in the paintings a viewer can find big picture ideas and even personal histories and stories. Stott resides in a small but beautiful city virtually hidden in the vast plains of the Canadian prairies. He works in an in-house studio with his wife and two young children.